So you’re looking for a Dyson Vacuum Cleaner? 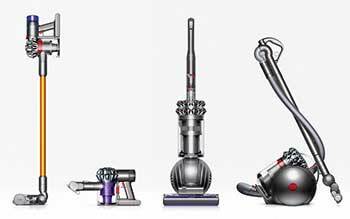 Dyson have been industry leaders in the world of vacuums for many years making top quality products that are built to last. I’ve gathered together and reviewed the very best Dyson has to offer, I hope you enjoy! I just want to quickly go over the different types of Dyson Vacuum, just so everyone’s on the same page! Upright Dyson vacuums are perhaps the most iconic, at least they are too me. 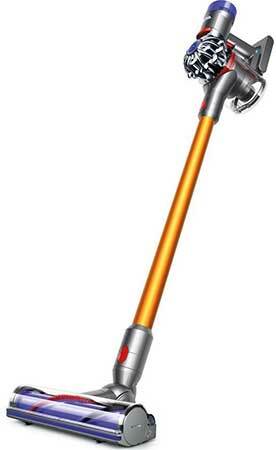 Nowadays the stick vacuums are becoming much more common and that’s what’s being shown in the adverts but to me, a Dyson is a big hefty upright vacuum. Their upright vacuums are superb quality, they have the Dyson Ball technology so you can easily glide them around the house making them much easier to use. Cylinder vacuums are the small ones that drag across the floor while you hold the hose. Nice and lightweight and really easy to use. 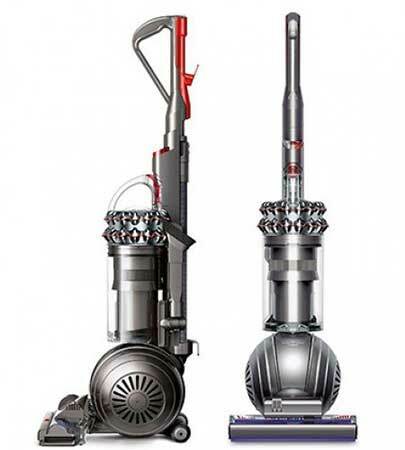 Dyson stick vacuums are now the type you’re most likely to see in an advert. The long stick with the motor at the handle and normally a handy hanger. Also cordless so you can just take them out vacuum the house and hang them up again which is really useful. Often a part of the Stick vacuums but while they are expensive you get excellent suction better than any other handheld vacuum around. Pun completely intended, I, of course, mean that Dysons have some of the best suction of all vacuums available. Really powerful motors and superb cleaning power. Dysons are also built to last, they have really solid build and can stand up to a lot. You definitely won’t need to replace one anytime soon! 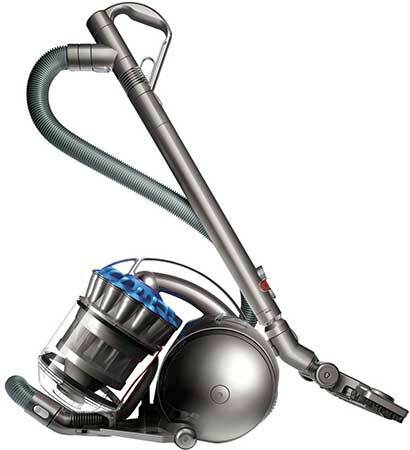 Dyson have been making vacuums for a long time. They’ve been a household staple for many years so they’ve had a lot of time to perfect what they do. So you get the brand trust when you stick with Dyson. If you have pets then a Dyson will be an absolute winner for you. They have models specifically for pet hair which are even better but even their basic models make short work of it. You can’t work around it, Dyson vacuums cost a lot. But they are worth the price if you can afford it. You absolutely get what you pay for so I wouldn’t say they are expensive but they are costly. The upright Dysons are heavy. The vacuums with the Ball technology are still very manoeuvrable but they definitely can’t be classed as Lightweight. The stick vacuums and the cylinder vacuums are much lighter but the handheld vacuum is a lot heavier than other handheld vacuums. The V8 is everything you need in cordless cleaning power. You can easily pick it up and get your house cleaned in no time. It’s run time is around 20 minutes so it’s best used for more frequent smaller cleanups, for a big house that might not be long enough. But if you’re in a flat or a small house it’ll be perfect. The charge time is 5 hours which is great for a cordless vacuum, and it converts down into a handheld vacuum so you can easily clean the stairs and your car. The main problem is with the wall mount that comes with it. It can be a bit tricky to get this screwed into the wall and if you’re not “handy” you might have trouble. It also doesn’t come with enough space to put all the attachments which are odd. The flip side is that you can just get a big tupperware and put the attachments under the sink. That way you can still get them when you need them. 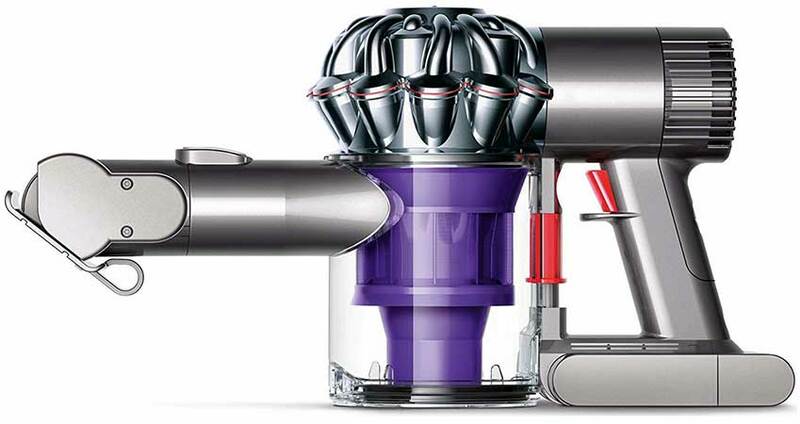 The main problem with the Dyson DC28C is that it’s quite a hefty cylinder vacuum so it takes up a lot of cupboard space. But if you have the space to store it you’ll be buying yourself a great vacuum cleaner. The ball technology means it’ really easy to pull around your house and the thing is a reasonable weight so very comfortable to use compared to an upright vacuum. The floor head automatically adjusts depending if it’s on carpet or hard floor so it’s nice and quick to clean around the house. And it has a nice low profile so you can clean under furniture with ease. Lastly, it’s bagless! That means you don’t have to keep forking out for bags every time you want to empty it. The Dc75 is an absolute beast of a vacuum cleaner. It has the crazy powerful suction that makes short work of pet hair and any other dirt on carpet and hard floors but it comes at a price. It’s nice and tall so you don’t have to stoop while you use it but it is heavy and feels like a bulky vacuum cleaner. But it has possibly the best vacuuming power of all Dyson vacuum cleaners so it is worth it. Just be aware that if you need something lightweight, this isn’t for you. It has Cinetic technology inside which means it is excellent at removing any pollen or allergens out of the air and trapping them in the dust container. Just make sure you empty it straight into an outside bin! Can’t use it while it’s charging. The Dyson V6 Trigger Pro is the best handheld Dyson has to offer, it’s got really great suction, especially for a handheld, and comes with a motorized brush for pet hair. It’s nice and lightweight and not as bulky as it might look so it’s nice and comfortable to use. The 20-minute run time is more than enough for any small jobs that a handheld is needed for. If you go to the more powerful setting you’ll only get around 6 minutes but you only need that for really stubborn dirt, mud in the carpet that sort of thing. It’s charge time is phenomenal at 3.5 hours from flat. I know of much smaller vacuums than this that will take upwards of 12 hours to fully charge. Overall, a great handheld vacuum that is well worth the price.